In our family, we have a tradition of holding one gift to open on January 6th, which marks the feast of the Epiphany and the end of the Christmas season for us. 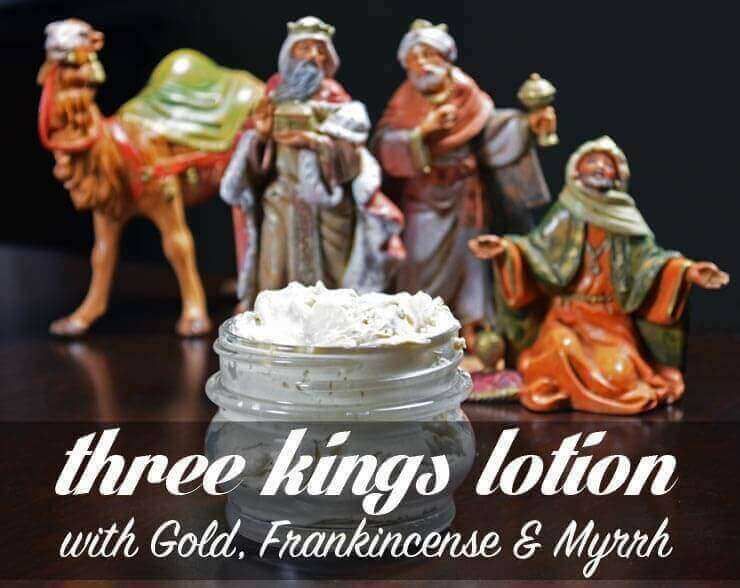 I wanted to find a fun way to teach our kids about this traditional feast which celebrates the arrival of the three kings bearing Gold, Frankincense and Myrrh, and I thought what better way that a homemade product that combined all three. 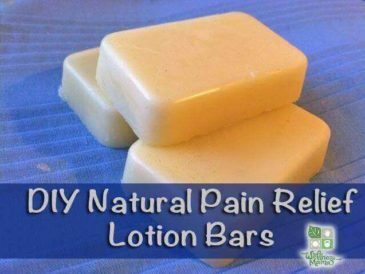 I’d already made Gold, Frankincense and Myrrh Lotion Bars, but wanted a smoother lotion that would be easy to make and that my kids could help with. As we made this, we learned about the benefits of each of the ingredients and what they symbolized. Gold was pretty straightforward but the other two are not as well known. Some speculate that frankincense signified a teaching role and sacrifice while myrrh predicted death and embalming. Both had practical benefits for mom and child though. Frankincense was often used to help balance hormones and for healing. Myrrh was often used on the umbilical cord to prevent infection and speed healing and both are considered calming and soothing. 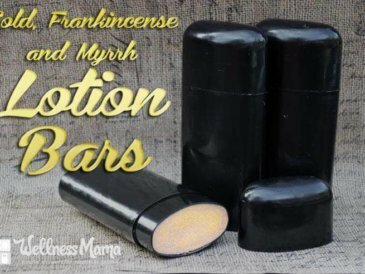 Frankincense and Myrrh are both extracted from the bark of certain trees and are considered medicinal herbs. I wanted to also make this an opportunity to teach my kids about oil and water and emulsification (homeschool science project) so we used an ingredient I don’t often use but that aids emulsification. It is called emulsifying waxt. There is some debate on how natural it is, though it is plant derived. Emulsifying wax goes through more processing than a truly natural wax like beeswax, but works much more easily for emulsification. In fact, we first attempted to get oil and water to emulsify by themselves in the blender and watched them separate completely after a few minutes. Once we added the emulsifying wax, they stayed blended and felt like lotion. 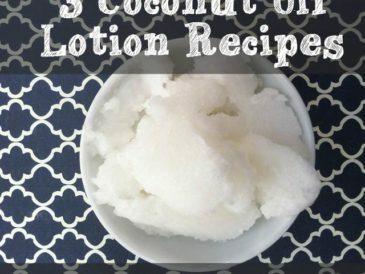 NOTE: Unlike my homemade luxurious lotion, this lotion does contain water and will have a shorter life than strictly oil based lotions. We made a small batch so we could use it all up within two weeks and we keep in the fridge. Some sources recommend using an antimicrobial preservative, which greatly extends the shelf life and avoids the need for refrigeration. 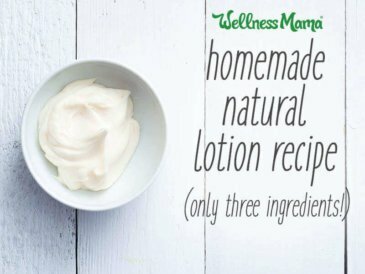 Almost all conventional lotions contain a preservative like this but I’ve seen conflicting research on products like this, especially in light of the emerging evidence of a skin microbiome, so I prefer not to use it. Make sure that all containers and ingredients are very clean. This lotion does not contain a preservative so to extend shelf life, make sure everything is as clean as possible. 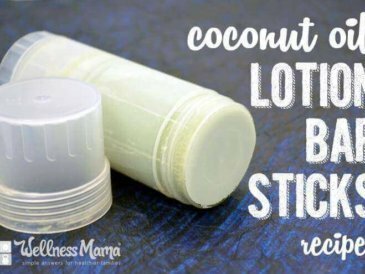 Melt the emulsifying wax and coconut oil in a double boiler until just melted. Remove from heat and add olive or almond oil and whisk in. Slowly add water, whisking to mix until all added. Return double boiler to heat and heat, stirring constantly, until the mixture becomes creamy and slightly thick. 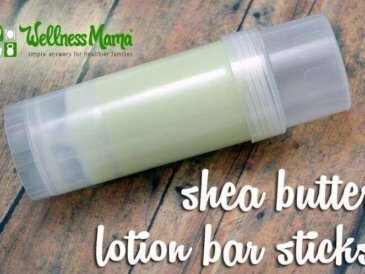 It will be the consistency of squeezable lotion from a store. Add essential oils and whisk in. Let cool and transfer to jar or bottle to store. I store in fridge to extend shelf life. Lasts for up to 3 weeks (this is why we made a small batch). Ever made a DIY project with your kids? How did it turn out?